The Provincial Chapter has concluded, and the newly-elected 2019-2023 leadership team takes office in this season of spring. We offer our good wishes and prayers for support for Sister Maureen O’Connor, Provincial Superior, Sister Christa Ann Struewing, Provincial Vicaress, Sister Rosily Menachery, Provincial Councilor, and Sister Janice Schneider, Provincial Councilor. 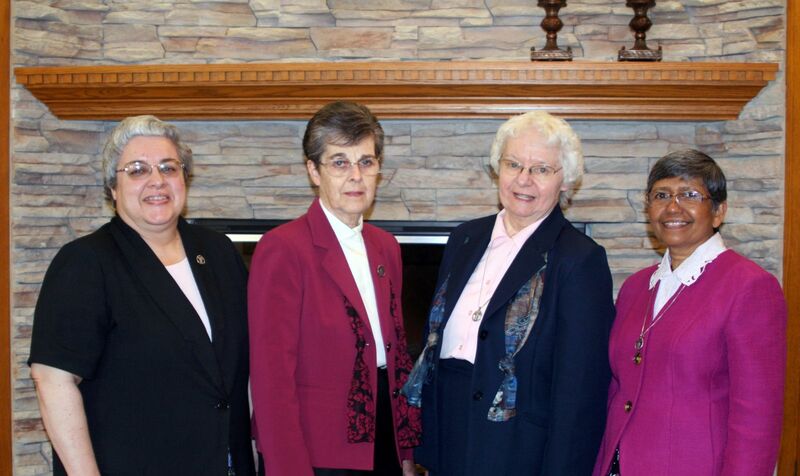 The Provincial Superior represents the American Province of the Hospital Sisters, its establishments and interests while responsible for directing the Province in spiritual life and its ministries. The Provincial Vicaress assists the Provincial in the Province business and in the absence of the Provincial Superior, she assumes her responsibilities. The two Provincial Councilors, together with the Superior and Vicaress, form the leadership team that directs the Province business. In addition, the Provincial Superior and her Council serve as Members of Hospital Sisters Ministries, the public juridic sponsor of Hospital Sisters Health System (HSHS) and Hospital Sisters Mission Outreach in which they have Reserved Powers. The Hospital Sisters of St. Francis is an international congregation of Franciscan Sisters founded in Germany in 1844, and their Provinces include Germany, Poland, USA, Japan, and India. The American Province, based in Springfield, IL, was founded in 1875 when Sisters from Germany arrived and began a healthcare ministry. The Province is the Founding Institute of Hospital Sisters Ministries which is the public juridic sponsor of Hospital Sisters Health System (HSHS) – a multi-institutional health care system in 14 communities in Illinois and Wisconsin with 15 hospitals, health centers and clinics, nearly 2,300 physician partners, and more than 14,600 colleagues. In addition, the Province sponsors Hospital Sisters Mission Outreach, a recovery and world-wide distribution of medical supplies and equipment, and operates Chiara Center, a Franciscan Place of Spirituality for individuals and groups seeking a retreat and conference center.